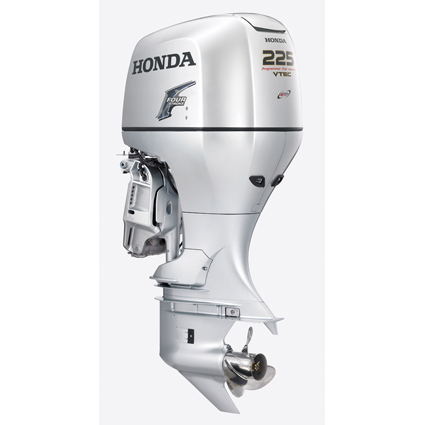 The twin engine package of the Honda 225hp outboard engine is made up of two ultra long shafts (30″), one counter rotation outboard, both electric starts, power trim and tilts, 12volt/60amp alternators on each outboard, dual control boxes mounted side by side for one hand easy operation and adjustable engine bars to link the outboards for steering purposes. 6 years warranty (2 years for commercial users) and includes many unique features and user benifits including free RYA level 2 powerboat training. Comes with: Basic flexable rigging package. Side mount control box, harnesses,Fuel line , Battery leads, Tachometer and trim gauge, a choice of 3 blade alloy propeller ,Tool kit, Owners manuals. Rigging kits can be upgraded to include different controls, more gauges, longer harnesses, stainless steel propellers and rigging hose covers.